Google Play Music All Access launches to take on Spotify | What Hi-Fi? 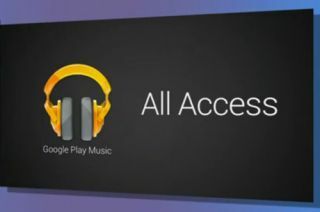 Google has confirmed the launch of a new music service, Google Play Music All Access, combining streaming music and access to your personal music library. Launching in the US today with a price of $9.99/month, there's no word on a Google Play Music All Access UK release date as yet but Google said it would be rolling out the new subscription service to other territories. Launched at Google's I/O developer conference, the new music service combines access to your own music with Google's streaming library of tracks, and promses seamless access across all your Google devices. There will be "millions of tracks" and streaming "radio without rules", alongside Google's "power of recommendation" for finding new tracks. Google says, "anything you can see you can play" in the new service, including tracks you've uploaded and bought, and it's all in your web browser. You'll also be able to stream your own 'radio' stations, with Google queuing up a list of songs based on what you're listening to. You can even preview the queue and edit it by removing tracks you don't fancy to or changin the order they play, using your touchscreen to slide them up or down the list. Google Play Music All Access launches in the US today, with a price of $9.99/month. You can get a 30-day free trial and if you sign-up sooner rather than later, before June 13th, you can enjoy a $7.99/month trial price. Google said the new music service would roll out to new territories but no word on a price or release date for the UK as yet. Google already offers a locker-style music service, Google Music, which allows you to access your own library of music and stream it on the move, as well as downloading music, a similar take to Apple's iTunes Match. Google is now adding a streaming subscription option, which will no doubt have the likes of Rdio and Spotify shifting uneasily in their seats. It also means Google has beaten Apple to the jump: an Apple iRadio streaming music service has long been rumoured but we may well have to wait until the Apple WWDC – when we could also see a new iPhone – for more information on that. The Google I/O conference kicked-off at 5pm tonight UK time, so more details on Google Play Music All Access and other news as we get it.